Many a times we come across a scenario where we get an input string with leading and/or trailing spaces. In such scenarios we would like to store it into the database by removing the leading and trailing spaces. But Microsoft doesn’t have a built-in TRIM function which can remove both leading and Trailing spaces. Instead it has LTRIM function which can be used to remove leading blanks and RTRIM function which can be used to remove trailing spaces. Let us understand these functions with examples and then see how we can nest these two functions together as shown in the below examples to remove leading and trailing spaces. From the above result we can see that the LTRIM function is removing only the leading spaces. That is it has removed only the leading 4 spaces and not the trailing 4 spaces. From the above result we can see that the RTRIM function is removing only the trailing spaces. That is it has removed only the trailing 4 spaces and not the leading 4 spaces. From the above result we can see that the nested use of RTRIM and LTRIM functions has removed both the leading and trailing paces.. That is it has removed both the leading 4 spaces and the trailing 4 spaces from the input string. We can create a user defined function like the below one. And use it wherever we want to remove both leading and trailing spaces. 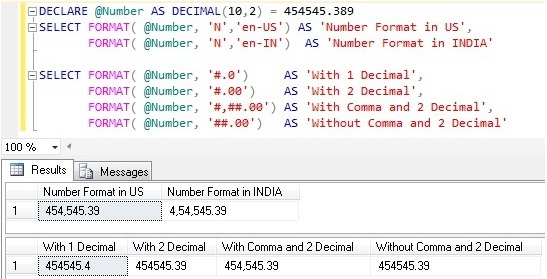 FORMAT is one of the new built-in String Function introduced as a Part of Sql Server 2012. It returns the value formatted in the specified format using the optional culture parameter value. 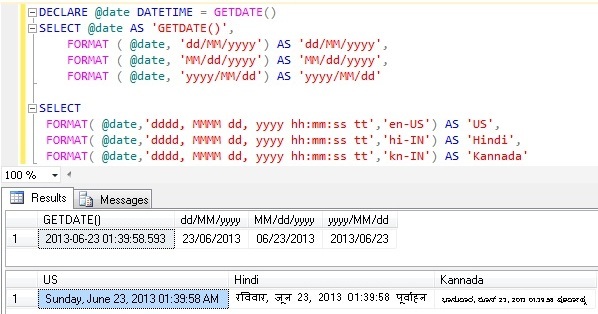 It is not an Sql Server native function instead it is .NET CLR dependent function. format: This parameter specifies the format in which the vlaue will be formatted. culture: This parameter is optional, it specifies the culture in which the value is formatted. 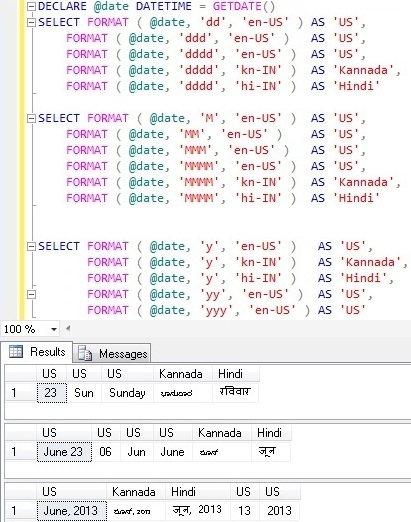 If it is not specified then the language of the current session is used. RETURNS: Return value type is nvarchar. The culture parameter ‘Test’ provided in the function call is not supported.